Which freestanding retail REIT is the best choice after the recent drop? Retail real estate investment trusts Realty Income Corp. (NYSE:O) and National Retail Properties (NYSE:NNN) have a lot in common. They invest in the same kind of retail property types, have the same lease structure, and are comparable in terms of size and balance sheet. Since the REIT sector has fallen considerably over the past few months, which of these two is the best net-lease retail REIT to take advantage of the depressed share prices? 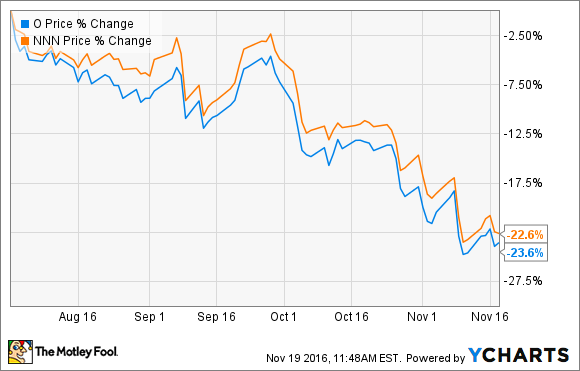 Over the past few months, REITs haven't performed well, and these two have been no exception. Since the beginning of August, both stocks have fallen by about 23%. In a nutshell, the market is expecting interest rates to rise over the coming years, and the combination of generally positive economic data and the election of Donald Trump to the presidency has bolstered these expectations. Interest rate increases are generally bad for REITs over the short term. Rising rates make safer income investments like bonds look more attractive, which creates selling pressure on "riskier" dividend stocks like REITs. Higher rates also make borrowing more expensive, which often translates into lower profit margins on newly acquired properties. Tenants sign long-term (15-20-year initial term) net leases, which require the tenants to pay property taxes, insurance, and building maintenance expenses. Realty Income is about twice the size of National Retail Properties by the number of properties owned. However, National Retail Properties has a slightly more diverse tenant base. The company has more than 400 tenants as compared to Realty Income's 247, and no tenant makes up more than 5.5% of the rental income, while Realty Income's largest tenant accounts for 7.3%. In addition, National Retail Properties is a pure-play freestanding retail REIT, while Realty Income takes a more diversified approach. Most of Realty Income's properties are freestanding retail, but about 20% of the portfolio is made up of non-retail properties, specifically industrial, office, and agricultural properties. Both companies have similar debt levels, and actually have the exact same (Baa1/BBB+) credit rating. Both have occupancy levels above 98%. Both have an outstanding record of producing strong total returns. Realty Income has averaged 17.9% per year since its 1994 NYSE listing and National Retail Properties has averaged 15.5% over the past 25 years. Both have a great history of dividend increases. Realty Income has increased its payout for 76 consecutive quarters, and National Retail Properties has boosted its dividend for 27 years in a row and is a member of the S&P 500 Dividend Aristocrats index. Both have a 4.4% dividend yield as of this writing. Since these companies are quite similar in most respects, and neither has a clear edge when it comes to recession-resistance, financial strength, or growth potential, this becomes a question of valuation. I own both stocks in my retirement account, and when I have some money to allocate to my retail REIT holdings, I generally go with whichever is cheapest at the time. Share prices are current as of Nov. 22, 2016. Adjusted, or normalized, FFO projections are used when available. National Retail Properties seems like the better buy right now from a valuation standpoint. Having said that, there are a few reasons why Realty Income deserves to trade for a slight premium. For example, Realty Income's larger size gives it a potential advantage when it comes to efficiency, and it does have a slightly better track record of delivering returns. However, I don't think these things are worth the current discrepancy in valuation, so I would go with National Retail Properties at the current price.